November 10, 2015 – The planet Mercury is being pelted regularly by bits of dust from an ancient comet, a new study has concluded. This has a discernible effect in the planet’s tenuous atmosphere and may lead to a new paradigm on how these airless bodies maintain their ethereal envelopes. The findings are to be presented at the annual Meeting of the Division of Planetary Sciences of the American Astronomical Society at National Harbor, Maryland, this week, by Apostolos Christou at the Armagh Observatory in Northern Ireland, Rosemary Killen at NASA’s Goddard Space Flight Center in Greenbelt, Maryland, and Matthew Burger of Morgan State University in Baltimore, working at Goddard. Earthlings are no strangers to the effects of cometary dust on a planet and its environment. On a clear, moonless night we witness the demise of countless such dust grains as they burn up in the Earth’s atmosphere in the form of meteors or “shooting stars.” At certain times of the year, their numbers increase, creating a meteor shower. This is caused by the Earth passing through a stream of dust particles left behind by certain comets. One of the most well-known showers, the August Perseids, originates from comet Swift-Tuttle, which was last seen back in 1992 and won’t be back in the inner solar system for another century. But Earth is not the only planet in the solar system to sweep up cometary dust in this fashion. Last year, comet Siding Spring came within 100,000 miles of Mars, loading its upper atmosphere with several tons of cometary material. The aftermath was recorded by instruments onboard several Mars-orbiting spacecraft such as NASA’s Mars Atmosphere and Volatile Evolution mission and ESA’s Mars Express. Bodies such as the moon and Mercury are typically thought of as airless, yet we have known since the time of the Apollo moon landings that they are surrounded by clouds of atomic particles either launched from the surface or brought in by the solar wind. Though tenuous by comparison to the dense atmospheres of the Earth or Mars, the observational record has revealed these “surface boundary exospheres” to be complex and dynamic entities, fascinating to study in their own right. NASA’s MErcury Surface Space ENvironment, GEochemistry, and Ranging (MESSENGER), the first spacecraft to orbit Mercury, measured how certain species in the exosphere vary with time. Analysis of the data by Burger and colleagues found a pattern in the variation of the element calcium that repeats from one Mercury year to the next. To investigate, Killen teamed up with Joe Hahn of the Space Science Institute, based in Austin, Texas, to understand what happens when Mercury ploughs through the so-called zodiacal cloud of interplanetary dust around the sun and its surface is pelted by high-speed meteoroids. The researchers found that both the observed amount of calcium and the pattern in which it varies could be explained in terms of the material thrown off the planet’s surface by the impacts. But one feature in the data did not make sense: the peak in calcium emission is seen right after Mercury passes through its perihelion — the closest point of its orbit to the Sun — whereas Killen and Hahn’s model predicted the peak to occur just before perihelion. Something was still missing. That “something” arrived in the form of a cometary dust stream. Discovered in the 18th century, comet Encke is named after the German mathematician who first computed its orbit. It has the shortest period of any comet, returning to perihelion every 3.3 years at a distance of 31 million miles (nearly 50 million kilometers) from the sun. Its orbit, and that of any dust particles thrown off it, is stable enough so, over millennia, a dense dust stream would have formed. Killen and Hahn proposed that Encke dust impacting Mercury could kick up more calcium from the surface and explain what MESSENGER was seeing. The match was not perfect, however. For one thing, Encke is closest to Mercury’s orbit about a week later than the calcium peak. The researchers postulated that the evolution of the dust stream over thousands of years had somehow shifted the stream away from comet Encke’s present orbit. But what was causing the shift? To find out, Killen and Burger teamed up with Christou to simulate the evolution of the Encke stream for several tens of thousands of years — the likely lifetime of the comet. Christou had to first compute a “best guess” of the comet’s orbit many thousands of years before it was first observed. 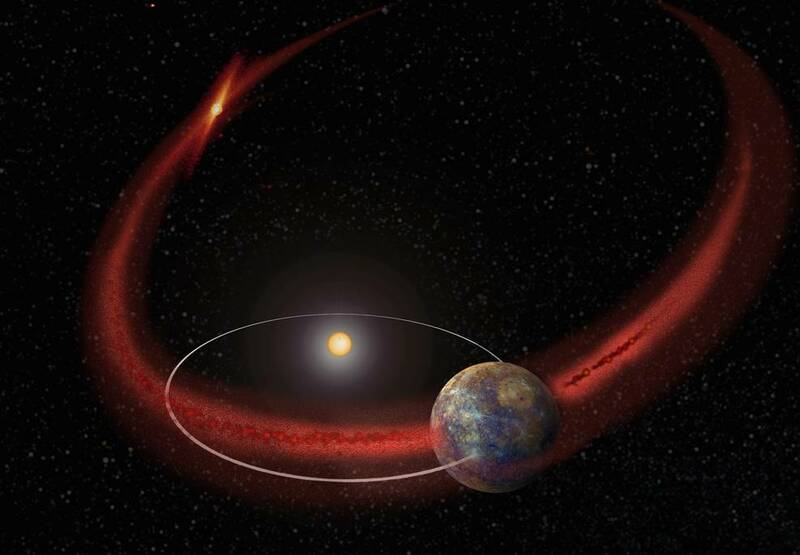 Starting from that point in time, he followed a cloud of simulated dust grains launched from the comet’s nucleus to find out if — and, more importantly, where — their present orbits would intersect Mercury’s. He found that the dust, rather than shifting away from the comet’s orbit, simply spread along it, forming a stream that encounters Mercury exactly when the comet does. Then he reran the model, to allow for a subtle interaction between the dust grains and sunlight called Poynting-Robertson drag. This creates an extra, though tiny, force on the grains which, over long periods of time, could amount to a significant change in the orbit. The result was that the orbit of the stream in the simulations shifted behind the comet’s orbit and toward the location where the peak in calcium emission was observed. Moreover, the size of the shift depended on the size of the dust grains — bigger grains means a smaller drag force — and on how long ago they were released from the comet. Christou found that he could reproduce the timing of the calcium peak for grains a millimeter or so in size, ejected from Encke between 10,000 and 20,000 years ago. This is consistent with what we know about cometary dust: droves of millimeter-sized cometary grains enter the Earth’s atmosphere every day, creating visible meteors. It also agrees with present best estimate of the age of the stream based on Earth-based meteor studies. “Finding that we can move the location of stream to match MESSENGER’s observations is gratifying, but the fact that the shift agrees with what we know about Encke and its stream from independent sources makes us confident that the cause-and-effect relationship is real,” Christou explained. The work has set an interesting precedent on the importance of the different dust populations in exosphere production. Killen looks forward to searching for the signature of the Encke stream on other exospheric species. “This will be further confirmation of the relationship,” she added. A paper describing the research appeared in the Sept. 28 issue of Geophysical Research Letters.